For inclusion in the 3rd edition of Eskilson’s Graphic Design: A New History, I propose graphic and digital designer Muriel Cooper. Working roughly from the mid 1940’s to her death in the mid 1990’s, Cooper worked in advertisement after her obtaining her BFA in design and BS in education 1944 from the Massachusetts College of Art. In 1952, Cooper became the first art director of the Massachusetts Institute of Technology publication office, now known as the MIT Press. She went on to design the renowned seven-bar colophon, a highly-abstracted version of the lower-case letters “mitp”, which became the identifying logo for the publication press and demonstrated her reductive, functional, geometric Bahaus design style. Along with teaching at the Institute, Cooper also founded MIT’s Visible Language Workshop where she taught experimental printing and hands-on production (Walker Art Centre). By the mid 1980’s, she was one of the founding members of the MIT Media Lab where she contributed to designing early computer interfaces. 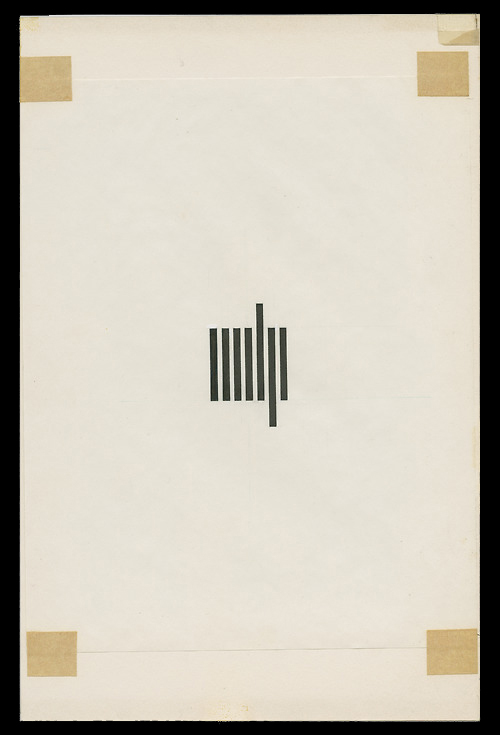 Muriel Cooper, mechanical artwork for the MIT Press colophon, 1963–4. Along with her colleagues and hired designers, Cooper promoted a Bauhaus-influenced, modernist style to MIT Press’ publications (McBroom). Cooper also felt increasingly restricted by the limitations of the canvas of a printed page and by the contemporary design production of her time, which was dictated by mass-production stemming from the Industrial Revolution. In fact, Cooper wanted designers to produce their work again as they did prior to this mass-production model that separated design and manufacturing. Cooper also believed that emerging technologies (such as the Macintosh personal computer and HP Laserjet printer of 1984) could empower designers. She was a strong advocate for the use of emerging technologies by designers in order for them to escape the restrictions of 21st century mass-production model, which was defining both the design process and the final product (Armstrong, 13). She encouraged her design students to hack and fiddle with production equipment themselves in order to put their own design production back into their hands. In this way, Cooper believed that production technologies could allow designers to rework and test their projects more easily, and that computers could permit these artists to work more instinctively and cooperatively with other designers and tech users (Armstrong, 14). She also focused her research on virtual information landscapes; she believed that the computer screen offered more depth and more possibilities in terms of design space manipulation where information could be in motion, streamed, and alive rather than be static and printed (Walter Art Centre). The computer offered thus an alternate space or landscape in which design could live. By promoting her ideas, Cooper believed that through the use of technology, designers would have increasing experimental space, possibilities, freedom, and time to alter their design as well as gain more control over the production of their final product. Typography in Space: a three-dimensional typographic space where the reader can browse freely.© MIT Media Lab (M. Cooper, D. Small, S. Ishizaki). By the teachings, workshops, and implementations that Cooper presented and initiated throughout her career as art director for MIT Press and as a professor at the institute, she revolutionized electronic communication and pioneered computer design interface graphics. For all that she has contributed to graphic design history through her role as an art director, as an innovative designer, and as a woman in a field more or less dominated by men, Cooper deserves a significant place within Eskilson’s future edited edition of Graphic Design: A New History. 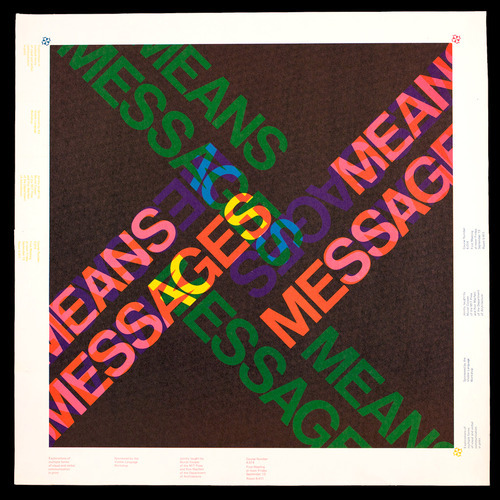 Muriel Cooper and Ron MacNeil, Messages and Means course poster, designed and printed at the Visible Language Workshop, MIT, c. 1974. Armstrong, Helen. Digital Design Theory: Readings From the Field. Princeton Architectural Press, 2016. “Muriel Cooper: Turning Time into Space.” Walker Art Center, walkerart.org/magazine/muriel-cooper-turning-time-into-space. De Stijl is characteristically ordered and precise, which Alex Bigman asserts is a reaction to the chaos of World War 1 that preceded this movement. It aims to bring clarity and harmony to design, using basic elements of line, shape, and flat planes of primary colour to create a universally approachable style. Piet Mondrian was an important player in this movement, and created a distinct style of geometric and linear grid paintings that influenced my image here. One of the big design trends in the design of the 20th century was the simplification and the reduction of elements in most styles of design esthetic. And while this had been a general tendency for a big part of the century, different styles, schools of thought and political movements have approached this in different ways and have inspired each other over the years. Here we will be discussing how Emory Douglas, The Black Panther newspaper, 1969 is inspired by plakatstil. the example given here of plakatstil is Lucien Bernhard, posters for Adler typewriters, 1908. There are a few factors that make this adamantly clear. First, the prominence of the title is shown in both. While the plakatstil poster only contains the name of the product and not a single other word of text, the black panther cover draws on this organization by establishing a high level of contrast between the titles “The Black Panther” and the rest of the text which is so small that unless you are standing very close, you can only read the title and see the image. This allows the message to be very direct, in that it focuses on the thing (weather the product or the political party) that it is trying to promote. The viewer can look at it and know what it is talking about in a matter of seconds. Another element that is clearly inspired by plakatstil in the Black Panther cover is the flatness of color. 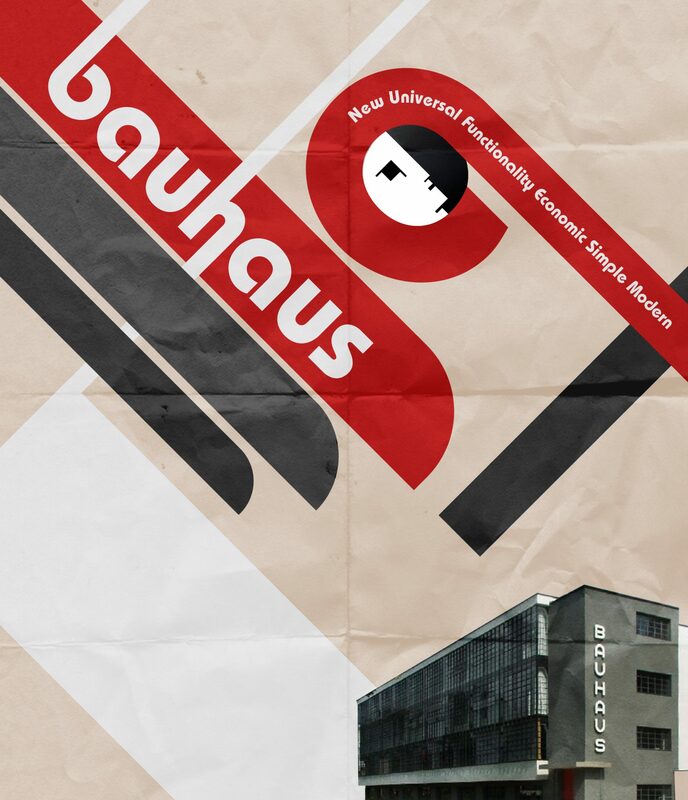 In both cases, colors are completely reduced to organic shapes of solid color, allowing for the poster to have a stronger overall visual impact on the viewers. There are not many details to the subject depicted but only enough visual information is given to make the object or the person recognizable. Being inspired by plakatstil, Emory Douglas is confronting the viewer with the subject of this man’s face. they both work with a limited palette, Douglas working in blue monochrome and Bernhard in only purple and orange Though plakatstil was rejected by the Germans in the 1st world war, here Emory Douglas attempts to take it back and repurpose it for the advancement of the black Marxist movement. 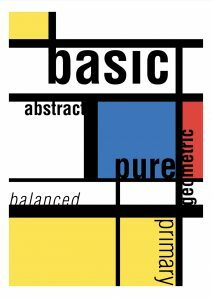 Basic, abstract, pure, geometric, balanced, and primary. 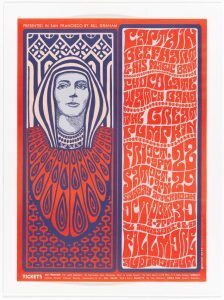 Designed for the Bill Graham Presents company for a gig in San Francisco’s Fillmore Auditorium featuring bands Grateful Dead, The Canned Heat Blues Band and Otis Rush. Interviewer: Hello Ladies and Gentleman! 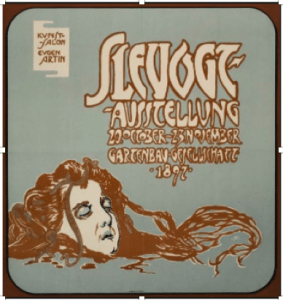 Today we have a very special guest who id going to talk about his poster for the San Francisco’s Fillmore Auditorium. 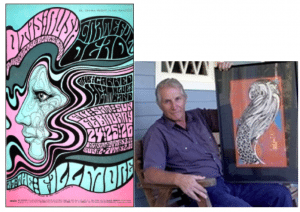 He is one of the key founders of “the rock poster” design and even designed a font that is still being used to this day. Please welcome, Wes Wilson! Interviewer: Don’t be so humble, sixty years later your work is still galleries all over the world from the MoMa, Tate and the AGO in Toronto. You deserve the introduction. Wilson: Wow man, don’t thank me, thank the acid. Interviewer: So its true? This art is inspired by the huge psychedelic revolution that boomed in the 60’s. Wilson: Ahah well that’s what people say, but there is a lot more behind my art than just that. I am fascinated by the reaction of complementary colours. That’s why I used the pink and teal in the Fillmore poster. I wanted to make things that people really loved to look at, and for the community that I was a part of, it involed the symbolism involved in their vices. In the 60’s, Kaliedoscops were all the rage. People loved anything that broke the laws of phsysics and seemed unworldly. They really wanted an escape from their lives and these images were the farthest thing from reality. Wilson: Well, the rock seen was all about the unworldly. 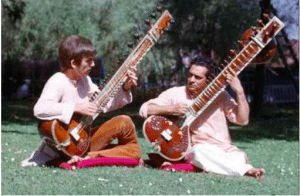 George Harrison came back India with all these weird instrument and people clung onto it because it was unlike anything they’d ever heard before, it was so experimental. And I try to do the same think with my art. I wanted to take my experiences and reformat them into my art so that people could relive psychedelia while they were sober and looking at the poster. Not only did it look really ‘far out”, but it gave the hippies a little taste of what these concerts and festivals would feel like. These images send the message the live music would put them into a trance. It advertised the beautiful woman that would be swaying to the music in the thick crowds, and most importantly, how their minds would feel while exploring it all. Interviewers: Wow I wish live music was still like it was in the sixties. Wilson: Ah yes. Everyone know my name because of that font I invented when I was young. Its sort of funny, I was sitting in my kitchen one day (because I didn’t have a studio since I wasn’t really a trained artists) doodling along when I had a sudden realization. Why don’t I try to draw with my text instead of just writing it? I was inspired to do this by Aldred Roller’s, an art nouveau designer who seemed to draw his text instead of just using a simple typeface. Anyways, My drawing had lots of spirals and optical illusions in order to mess with the eye but my text looked really bland and didn’t match into it. So I decided to make the letters part of the drawing instead of just appearing beside it. My goal was to completely fill the space with imagery so your eyes would get lost in the poster. I had to squeeze all of the text into the wavey spaces in between the spirals and waves and by the time I was done, it felt completely unworldly. Interviewer: Why do you think the text is so effective? Interviewer: Don’t you think that your text kind of defeats the purpose of a poster? Its supposed to communicate information, but your texts is very hard to read! Wilson: Well I make posters that people love to look at. When they invest the time in staring as they get lost in the letters, they eventually figure out what it says. I don’t think this style would become popular in this decade because internet culture must deliver information to quickly grab people’s attention, but the fast pace of consumption wasn’t as important in the sixties. Interviewer: How did you get into poster design? Wilson: Well I was doing some design work in San Fransico for a man named Bob Carr who ran all the hippie stuff in Hait Ashbery. I was making posters for poetry nights and jazz halls. Bob was just starting up a small printing firm in his basement to help promote all his events and make money on the side. So I had the full facility to create lithograph posters with all the tools and colours I needed. I started to get really slammed with work when I got intouch with a promoter Chet Helms. He got all the huge jobs for be with the Beatles, the Doors and the Greatful Dead. Interviewer: So, what will your next project be? Wilson: Nothing because I died 4 years ago. Pop Art, A bold and colorful style of design using vibrant colors, a less detailed, more graphic design, with a strong use of repetition. Pop Art is sometimes laid out like a comic book page, with each panel being different colors but with something still related to it. The piece on the top is of Andy Warhol’s Marilyn’s and on the bottom a piece by me, of someone biting a caramilk chocolate bar. It’s a long story. This piece was used for a page spread for an assignment I did and I wanted to include all kinds of different types of art influences in my work, Including Pop Art. 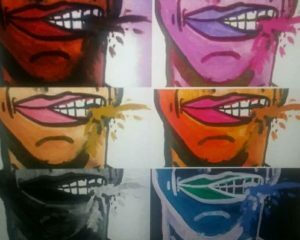 Pop Art has not only influenced me it has been used in several advertisements and other forms of media. 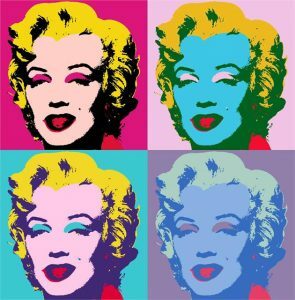 Pop Art is still used today and if you ask me is one of the most recognizable and distinct art styles of all time. It is constantly evolving just like everyday art and continues to influence modern art styles and their artists. It has a world wide appeal with its use of color and its content. Without Warhol’s original style playing such a heavy part in the pop art style, An idea like this for my own work, would not have been possible. subversive ransom notes. all ripped up.